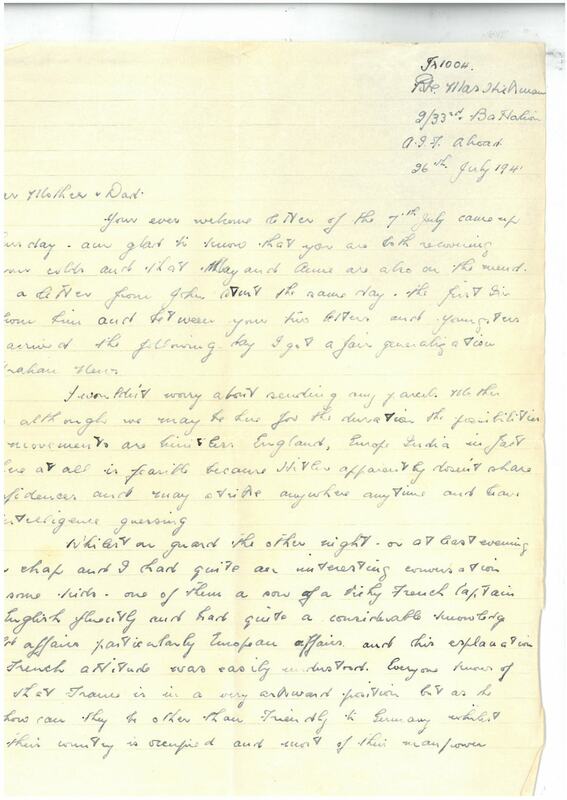 Your ever welcome letter of the 7th July came up on Thursday – am glad to know that you are both recovering from your colds and that May and Anne are also on the mend. I had a letter from John sent the same day – the first I’ve had from him and between your two letters and Youngster’s which arrived the following day I got a fair generalisation of Australian news. I wouldn’t worry about sending any parcels Mother because although we may be here for the duration the possibilities of our movements are limitless – England, Europe, India – in fact anywhere at all is feasible because Hitler apparently doesn’t share his confidences and may strike anywhere, anytime and leaves our intelligence guessing. Whilst on guard the other night – or at least evening – another chap and I had quite an interesting conversation with some kids – one of them a son of a Vichy French Captain spoke English fluently and had quite a considerable knowledge of world affairs particularly European affairs and his explanation of the French attitude was easily understood. Everyone knows of course that France is in a very awkward position but as he said how can they be other than friendly to Germany whilst half their country is occupied and most of their manpower are prisoners. But for all that he was very definite in his opinions of De Gaulle. 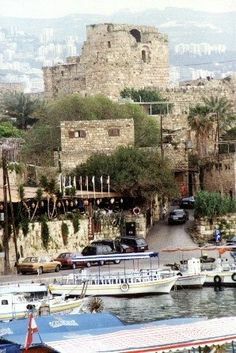 Whilst out in the carrier the other day we went through a town called Jbeil – just another Syrian village to all outward appearances but with a very interesting history. 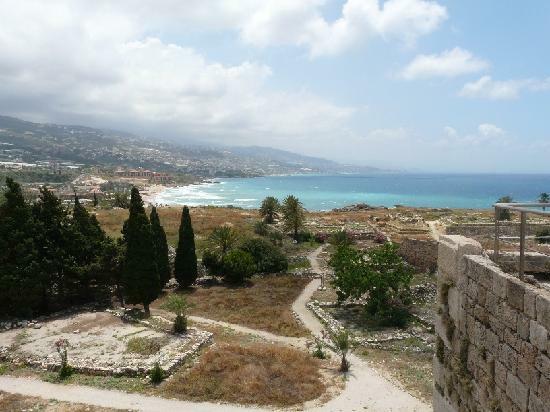 It’s built on the site of the ancient Venetian (sic – in fact Phoenician) capital of Byblos which according to the guide flourished about three thousand years before Christ. The ruins of the royal and public cemeteries can be seen from the towers of a Crusader castle built nearby. There is evidence of considerable excavation and the guide told us that French archaeologists had taken a lot of gold and jewels from the graves of the Kings. Still standing too are the marble pylons and sacrificial stone of a Roman amphitheatre. Syria seems to have ben conquered and occupied by many different people at various times and this may account for their apparent indifference in the present situation. To them one nation’s sovereignty is the same as another. The Lebanese are one class – the Syrians another – whilst the people of the mountains where we fought are known as the Jebel Druze and they dissociate themselves from both the others both in national characteristics and religion. They are said to belong to one of the lost tribes of Israel and to have been the original worshippers of the golden calf. I believe they gave the French a lot of trouble in 1925-26. Some of us were camped near a batch of the sixth division cavalry for a bit over a week – a great crowd of fellows except for one sergeant who as I later found out is a country youth from a small outback town and saturated with two ideas – his own importance to the world and a dislike amounting almost to an obsession for what is now the seventh division – that is those who had the trip to England. You’ve no idea the feeling there is on this matter – though most fellows just envy us some are very hostile which of course is quite natural. Anyway the night before we left them they put on a bit of a show. Their canteen came up and between us we got a fair quantity of beer and had a little open air party reminiscent of the club socials. We had a couple of good singers – Eric Batchelor of the Cav – I mentioned him in another letter (a nephew of Mrs Lew Abbery) and our own Aggy Lloyd who sang over the BBC in a diggers broadcast- and between their solo and duet items and community singing we spent a very pleasant evening which attracted the attention of quite a number of locals. There was an old lady living nearby who was evidently something of a boss in the district. We watched her making cotton thread, baking Mungaree (Arab bread) and in other ways she was a continuous interest. She’d jabber away about two thousand words a second and be quite annoyed when you couldn’t understand her. 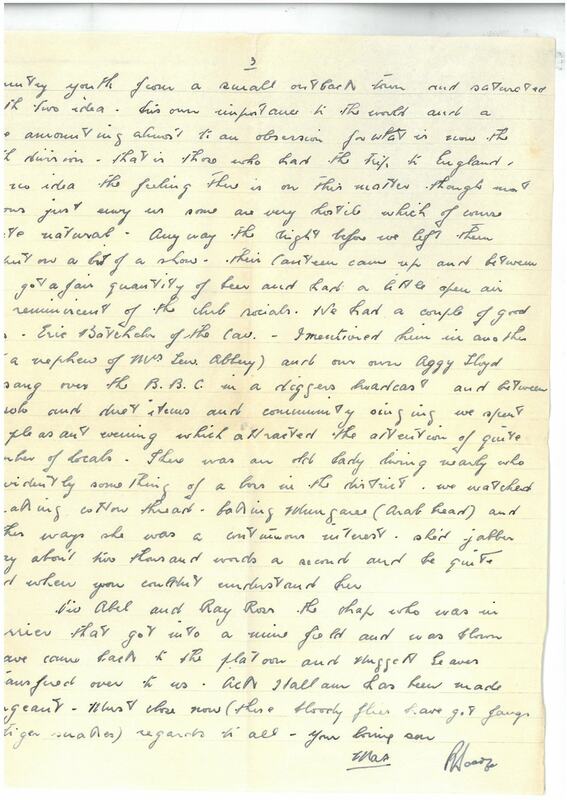 In his letter of July 16, Dad speaks of being camped in ‘ a pleasant but very quiet spot on the coast’. From The Footsoldiers we learn that this camp was in fact at El Fidar, just south of ancient Byblos which had been under excavation by the American University in Beirut since 1935. In the following months, the Battalion moved north to Tripoli to defend its vital oil storage facility from potential attack, and later to the hills north-east of the port, as it was still thought that the Axis campaign would extend into the Middle East. Dad’s comment was probably accurate on this occasion. According to Wikipedia, Vichy France…was the pro-Axis government headed by Marshal Philippe Pétain from 1940 to 1944….From 1940 to 1942, while nominally the government of France as a whole, Vichy only fully controlled the zone in southern France not occupied by German military forces, while Germany occupied northern France…. Germany kept two million French soldiers in Germany as prisoners doing forced labour as hostages to ensure Vichy would reduce its military forces and pay a heavy tribute in gold, food, and supplies to Germany….The greater part of the overseas French colonies were originally under Vichy control, but it lost one colony after another to Charles de Gaulle‘s Free France….Free France and its Free French Forces were the government-in-exile led by Charles de Gaulle … and its military forces that continued to fight against the Axis powers as an Ally of Great Britain after the fall of France. It was set up in London in June 1940 and also organised and supported the Resistance in occupied France. De Gaulle, a French government minister who rejected the armistice concluded by Marshal Philippe Pétain and who had escaped to Britain, exhorted the French to resist in his BBC broadcast “Appeal of 18 June” 1940 which had a stirring effect on morale throughout France and its colonies, although initially relatively few French forces responded to de Gaulle’s call. So – like Marshal Petain – perhaps the Vichy officer and his son thought De Gaulle was a traitor rather than a patriot. They may have genuinely thought that appeasing Hitler was an appropriate strategy for France’s survival. (De Gaulle was tried in absentia in Vichy and sentenced to death for treason). 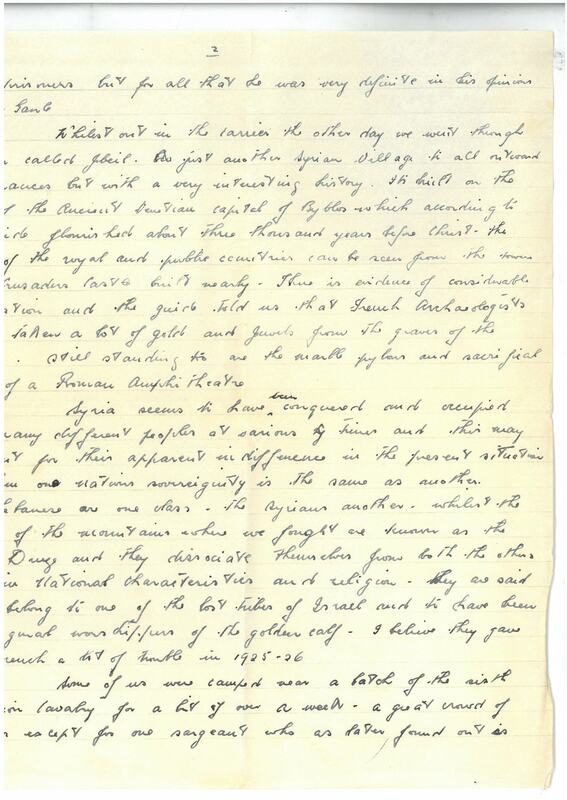 From The Footsoldiers: Some few days after we came to Fidar a general order from British Command was issued that we were not to mention the fighting in any of our letters home. No mention of the French Foreign Legion, or of our losses were to be discussed whatsoever. The Syrian campaign was in effect to be played down and given little or no after publicity. Few at the time were upset by this, but it was the beginning of that playing-down of our efforts that in later years gave rise to the description of us as the ‘Silent Seventh’ and other such remarks that at times got quite ugly in gatherings with men of the 6th and 9th Divisions. 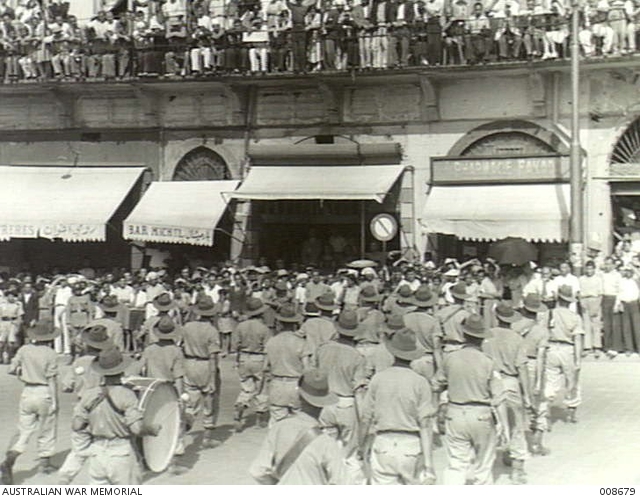 Later, when we were returned to Australia most people were aware of the activities of the 6th Division in the desert, Greece and Crete and the 9th Division at Tobruk. Few had heard of the prolonged and bitter fighting of the 7th in Syria. This entry was posted in Camps and Barracks, Middle East, organisation, The course of the war, Uncategorized, world and tagged armistice, Byblos, Jebel Druze, Ray Ross, Silent Seventh. Bookmark the permalink.